As the prosecution of the war against terrorism, maritime illegalities and militancy continues, the Nigerian Navy (NN) on Friday graduated 70 officers after a one year intensive training on military planning and theatre of war operations. The graduation ceremony, which took place at Nigeria’s premier naval training school, Nigerian Navy Ship (NNS) Quorra, Apapa, Lagos, saw 24 and 46 officers graduate from the Officers Long Course (OLC) and Sub Lieutenant Technical Course (STC), respectively. 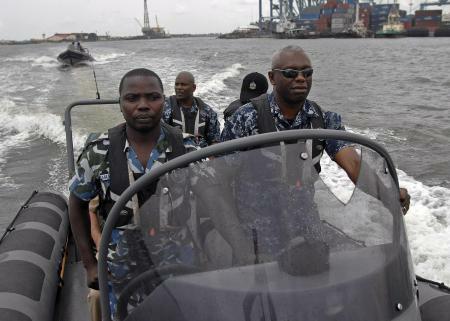 Over the course of one year, the officers were trained in Above Water Warfare (AWW), Under Water Warfare (UWW), Navigation and Direction (ND) and Communication and Information Technology (CIT). In his speech, the guest of honour, the Flag Officer Commanding, Naval Training Command, Rear Admiral Ifeola Mohammed, said the OLC and STC represents the pathway to professionalism in the navy. He said, “Modern day naval operations have become more complex and navies around the world are becoming even more sophisticated by the day. “Therefore, it is necessary to ensure that dynamism in order to keep pace with modern day challenges and realities of naval operations. “This is consistent with the Chief of Naval Staff (CNS), Vice Admiral Ibok Ette-Ibas’ Strategic Directives 2015-1, which NAVTRAC has implemented to the later.